As Fall returns this weekend to Central Ohio, it’s a good time to reflect on the changing seasons of the Columbus Jazz Calendar. While the outdoor music season is about over (but not quite), new and established indoor live jazz options are returning to the schedule. Local universities are back in session with programming on deck, like exciting shows from the Wexner Center and more intimate collegiate music-making at or presented by schools like OSU, Capital and Otterbein. Of course, dependable jazz venues are busy for the fall, including a resurgent jazz schedule at The Refectory with great shows like the Dan Wilson Quartet on October 12th and A Tribute to Ray Charles on October 13th with Roger Hines (Charles’ longtime bassist), Phil Clark, Bobby Floyd and Tony McClung – make your reservations at 614-451-9774 NOW! Stay tuned to our site for info on great opportunities to see a variety of live jazz in the coming months, and thanks for reading! Friday, September 22nd (9pm – midnight): Funk Worthy with The Big Badd & PLG at Club Voodoos, Merion Village. This new South Side live music destination is presenting a wide variety of entertainment, which luckily includes some jazz-flavored events. Funk Worthy, a 7-piece funk/fusion group with Capital roots, brings an energetic show to the stage with a sound incorporating a wide variety of vibrant elements. The Big Badd, which shares members with Funk Worthy, is “reaching all the way from Stevie Wonder to Justin Bieber to bring their own flavor of jazz to the world of pop music.” Columbus reggae trio PLG shares the bill. Cover is $5 for a triple bill of young local talent. 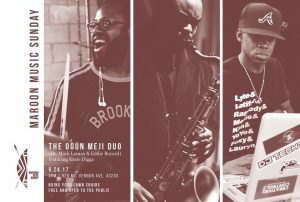 Sunday, September 24th (3 – 5pm): Maroon Music Sunday Featuring the Ogún Meji Duo with Krate Digga at Maroon Arts Group, 925 Mt. Vernon Avenue. The Maroon Arts Group (MAG) is “a collective of creatives who have galvanized to develop and provide a platform for conscious art centered around the preservation and promotion of cultures of African descent.” As part of their new endeavor Movement Pursuing Arts, Commerce & Community (M PACC), MAG will present an exciting outdoor performance at their King-Lincoln Bronzeville facility. The Ogún Meji Duo, the evergreen, telepathic pairing of tenor saxophonist Eddie Bayard and drummer Mark Lomax, will be joined by celebrated DJ Krate Digga for a program exploring the music of the historic Maroon culture. Enjoy a stimulating free concert in a friendly community setting. The Ogún Meji Duo recently released a live recording entitled holler that will have a release party in the coming months – look for a review and more info on our site in the near future. Thursday, September 28th (8 – 10pm): Jazz at OBN: One O’Clock Combo & Berg Combo at Old Bag of Nails, Westerville. Otterbein University’s roughly monthly series of performances by student jazz groups kicks off a new school year at the Uptown Westerville location of the fish and chips (and much more) chain. This installment presents two combos playing a variety of standards and jazz favorites. The One O’Clock Combo includes: Nathan Bell, guitar; Halle Craig, bass; Alan Paul, saxophones; and Brandon Williamson, guitar. The Berg Combo includes: Allison AC Asarch, vocals; Halle Craig, double bass; Margot Marshall-Goetz, saxophones; Eric Stratton, double bass; Brandon Williamson, guitar; Sam Carpenter, guitar; Dominic Quiggle, electric bass; and Max Sheridan, double bass. The event is free and open to the public, so come see Otterbein’s skilled students and enjoy a great meal.